Take a sunset stroll, enjoy a meal in the open air, and buy the best produce around at the Al Fresco Street Market. 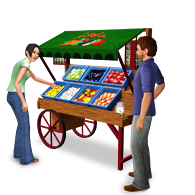 Professional gardeners can come to the market and sell their fresh produce while children try their hand with the lemonade stand. Best of all? This venue comes with new harvestable plants: Eggplant and Lemon Tree!